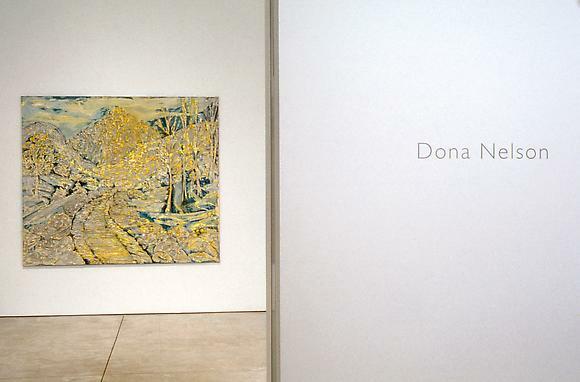 Born in Grand Island, Nebraska, Dona Nelson has lived and worked in New York since 1968. Throughout a career spanning several decades, Nelson has been steadfastly occupied with the exploration of a painting's ability to embody the nature of experience – be it visual, emotional, or intellectual. In her latest paintings, the artist continues to eschew the concept of a "signature style" by investigating the medium through various techniques. In one group of works, she begins by creating a replica of a painting done by her mother. Nelson then builds up the surface of the copy painting, creating a three-dimensional image with modeling paste, cheese-cloth and acrylic mediums. Using a highly physical process, the artist allows her body to respond to the familiar image of her mother's painting and to create a tangible result. In other works, Nelson begins by creating three-dimensional constructions that are abstractions derived from her intuition. She then makes rubbings on stretched canvas with charcoal or pencil, creating flat images from the relief. Several "found images," varied according to the pressure applied to the canvas and the size and softness of the graphite or charcoal, can be derived from one constructed relief. Literal representation and abstraction become interchangeable. For the last decade Nelson has been creating groups of paintings, cooly and clearly exploring specific visual issues, while exuberantly submerging herself in the more unpredictable subjective flow of metaphor and emotion. illusion of space on a two-dimensional surface as well as the effects of memory and emotional response to the creation of an image.